Michelle has written the ultimate guide to presenting your ideas and influencing people using techniques that actually work. It’s the only book in the whole world that covers the three essential phases to presenting in a thorough way packed full of examples. It’s Michelle’s life’s work and passion. If you want to be a more effective, confident and persuasive presenter choose to work with the expert. Michelle Bowden, author of the best-selling ‘How To Present’ (Wiley), is a qualified adult educator (MEd. Adult Ed.) and a successful conference keynote speaker in her own right. Michelle has been nominated for the past seven years for the PSA Educator Award for Excellence. Michelle runs her 2-day public Presentation Skills Program Masterclass every month in Sydney and also at selected times in Melbourne, Brisbane & Canberra. She’s facilitated her Persuasive Presentation Skills training more than 800 times for over 8000 delighted participants over the past 19 years with consistently excellent results. 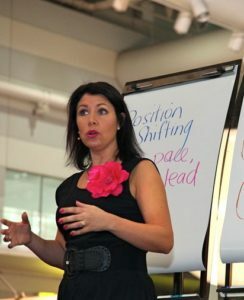 Michelle Bowden is a Presentation Skills and Persuasion Expert. I was terrified of public speaking and for 20 years I did everything I could to avoid it. 3 weeks after attending Michelle's training I presented to 200 people with excellent results and now I'm actually looking forward to the next opportunity - completely unbelievable! I highly recommend this training to you if you are nervous when speaking in public. Michelle Bowden has the education and experience to ensure you get value for your training dollar or your money back – guaranteed. Michelle is a consultant to a blue chip list of International clients. She has worked with many of the top companies in Australia across industry: from finance, and banking & insurance, to technology, pharmaceutical, telecommunications, cosmetics, utilities, and the government sector. Michelle Bowden is also well known for her executive coaching to help CEOs and senior executives from Fortune 500 companies pitch their ideas at board level. STOP! Your PowerPoint is Killing me! 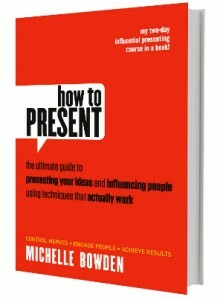 Michelle's most recent book, How To Present: the ultimate guide to presenting your ideas and influencing people using techniques that actually work (Wiley) is an internationally published, best seller. Presentation Skills training should be FUN! Michelle Bowden is renowned for achieving results through learning and laughter. She has a passionate, entertaining, and highly interactive approach to her presentations that ensures behavioural change every time. Michelle fundamentally believes that when you laugh as you learn, you learn more and retain it for longer. 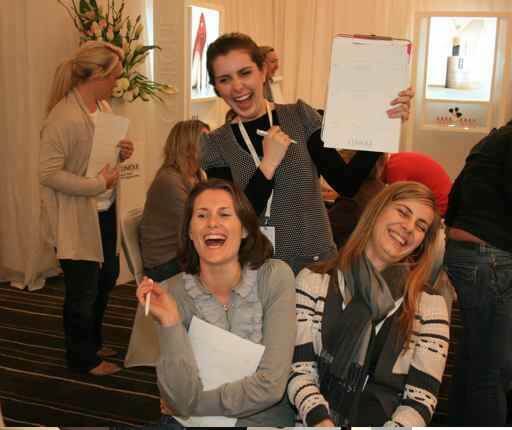 Delegates from Michelle’s training are still using her techniques 18 years later – that’s an exciting ROI for you!